A reliable source for Downdraft Tables information and a resource for accessing leading Downdraft Tables and suppliers. The particles released during manufacturing processes are hazardous to both worker and equipment health, quickly leading to a number of problems if particles are not captured by dust collection equipment and filtered from facility air. Dust collection addresses this problem by drawing contaminated air through a filter or separator, trapping harmful particles and releasing cleaner air into the atmosphere or back onto the work floor. Industrial dust collectors come in various types and sizes, including fabric filter baghouses and jet dust collectors, cyclone dust collectors, wet dust collectors, cartridge collectors, small dust collectors, portable dust collectors, downdraft tables and dust collecting systems complete with multiple suction hoods and overhanging ductwork. Dust collection is a vital process for coal handling, cement fabrication, metal fabrication, mining, chemical processing, woodworking, pharmaceutical, recycling and agricultural industries, among many others. Industry-specific state OSHA regulations require companies to hold their facilities to strict standards for indoor air quality, and the EPA and other regulatory bodies put limits on emissions of dust, smoke and fumes into the atmosphere. Downdraft Tables The particles released during manufacturing processes are hazardous to both worker and equipment health, quickly leading to a number of problems if particles are not captured by dust collection equipment and filtered from facility air. With 20+ years in the industry, it is no wonder Quality Air Management manufactures and supplies the newest, most revolutionary technology available. 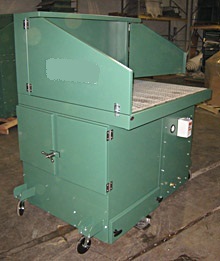 This includes a wide variety of quality dust collectors in standard and custom configurations. Atlantic Dust Collection is committed to providing you with the highest level of customer service and the best most cost effective way to keep your facility clean, safe and functioning properly. The IVEC® Intelligent Ventilation Energy Control system can work with the ventilation system that your company already has, turning the equipment on and off as needed, and allocating only the necessary power. At Airex, airborne contaminant reduction ranks highly among our areas of expertise. Over the years, our company has become a well known authority in air decontamination. Our dust collecting systems are designed to eliminate respirable airborne contaminants from the work environment. Eliminating airborne contamination in the workspace can lead to better employee performance and a lower rate of absenteeism. With more than 60 years as a leader in air-blast equipment, Empire produces an extensive line of dust collectors including baghouses, cartridge dust collectors, room ventilation systems, media reclaimers, and vacuum recovery systems. 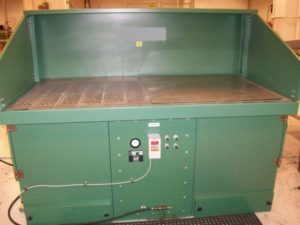 Downdraft tables are ideal for industries such as metalworking, woodworking, pharmaceutical, automotive, coal handling, agricultural products and recycling. One of the advantages of downdraft tables over other systems is that they can be customized in numerous ways to fit a particular application, without having to retrofit an integrated dust collection system. Down draft tables are designed to contain and exhaust heavier than air particles, lighter than air particles, fumes, fine particulates and powders. The top of downdraft tables is a perforated rigid grill through which airflow is both possible and uniform. Once air is pulled down through the perforated top it enters an exhaust chamber mounted directly underneath the top. The exhaust chamber contains filters that can capture particles as small as .5 microns. Some tables are equipped with pulse-jet air blasters directed at the filter that periodically clear off the filter to improve its operation. In addition, the exhaust chamber has multiple branch ducts attached underneath with balance dampeners attached to decrease the noise level. Everything underneath the exhaust chamber is enclosed into a duct that can connect to a facility’s duct collection system or can have an output area on the side or back of the chamber for the filtered air. There are two main types of downdraft tables: wet downdraft tables and dry downdraft tables. Wet downdraft tables employ a standard filter element and a liquid, typically water, in order to collect flammable metal dusts like magnesium, aluminum or titanium. Wet dust collectors in downdraft tables feature a number of additional devices including impellers for water reversal, sludge containers for captured metal particles, water level controls, after-filtration devices and mist eliminators. Dry downdraft tables are simpler, employing a standard filter element to collect vapors, dust, smoke or fumes. Besides wet versus dry, downdraft tables also vary by size, downdraft airflow, minimum particle size filtered and efficiency.